What happens when the question is put to the moving parent as to what he/she will do if the relocation request is dismissed? Is it possible to avoid financial disclosure by simply admitting one's capacity to pay the amount of support claimed? What happens if you split family patrimony assets prior to the divorce judgement ? Can one spouse sue another in damages for causing the breakdown of the marriage? Divorce – other party won't "sign"
The fact that you were married in Quebec does not mean that you can file for divorce in Quebec. To file divorce proceedings in Quebec either you or your spouse must have lived in Quebec continuously for one year before the date on which the proceedings are issued. A divorce motion brought in Quebec, where neither party has one year of prior continuous residence in Quebec, may be dismissed for lack of jurisdiction. A divorce may be granted if there has been a “breakdown of the marriage”. The Divorce Act (s.8 (2)) defines “marriage breakdown”. Generally it consists of separation for one year, adultery, mental cruelty, or physical cruelty. If you are living separate and apart, you are not required to wait for one year to elapse to institute divorce proceedings. You can file for divorce at any time after your separation, and even prior to the expiry of one year. However a judgement of divorce cannot be granted until your separation has lasted for at least one year. In your divorce motion, in the part that deals with the grounds for divorce, you should specify the date on which the separation occurred. By invoking adultery, mental cruelty, or physical cruelty you do not have to wait for one year before a judgement of divorce can be granted. Many people believe that spousal misconduct gives the aggrieved party an advantage, regarding either the financial or custody issues, as a form of punishment to the guilty party. This is not true. ...... the court shall not take into consideration any misconduct of a spouse in relation to the marriage. You have 3 years to seek a marriage annulment under Quebec law. The grounds for marriage annulment are similar in many respects to the reasons that justify the annulment of contracts in civil law. The interim stage (red) covers the period from the date of institution of the proceedings to the date of the provisional judgement. The provisional stage (green) overlaps the interim stage and refers to the period from the date of the institution of the proceedings to the date of the final judgement. Provisional judgements, if necessary, retroactively supersede interim judgements and apply going forward to the date of the final divorce hearing. The principal aim of a provisional judgement is to maintain, as much as possible, the living standard enjoyed by the family while it remained together. The final stage (blue) refers to the judgement rendered at the final divorce hearing and beyond. The Court having jurisdiction in custody matters is the Court of the place where the child is domiciled. A child's domicile is same as that of the parent who has been granted custody. if one of the parents has moved the child from the place where he lived with both parents to a new location without the consent of the other parent. Such a move is referred to as an "unlawful removal". An "unlawful removal" cannot give a court jurisdiction to hear a custody dispute. if it determines that the Court of another jurisdiction is better placed to decide the issue of custody because the child has a more "substantial connection" to another jurisdiction. This may occur when a child has recently been moved by one of the spouses to Quebec from another place. In any custody dispute the interest of the children (and not the parents) is first and foremost. The most important criterion in deciding custody is what is in the best interest of the child. It is not what is best for the father or the mother. The courts do not give preference to either the mother nor father in determining custody. There did exist a principle known as the “tender year’s doctrine”, which determined that, everything being equal, custody of a young child (an infant or toddler) would be awarded to the mother. This principle no longer applies in today's law. The principal factors taken into account in determining custody are the respective parental capacities of the parties (ability to provide for the basic physical and emotional needs of the children), the history of care giving (i.e. who was the primary caregiver during co-habitation), involvement in activities, availability for the children (personal schedules), communication with and attitude towards the other side, willingness to facilitate contact between the children and the other party, what the children may want etc. Parental alienation – where one parent turns the children against the other by for example speaking badly of the other parent to the children– is considered conduct that is counter-indicative to parental capacity required for custody. Alienation by the custodial parent is a justification for a change of custody. Children should not be used as intermediaries to send messages to the other parent, nor should there be any discussion of the adult issues in the divorce case with the children (example – “Your mother is taking all my money. She is making me poor”). Such conduct is also considered counter-indicative to parental capacity required for custody. Both parents jointly exercise parental authority irrespective of the nature of the custody arrangement. This means that major decisions, which usually concern health, education, religion, are made by both parents together. The Court retains the authority to decide any dispute that may arise between the parties as to the exercise of parental authority that they are unable to resolve themselves. This will involve a disagreement on a decision that is to be made jointly which the parties cannot resolve themselves. The idea of sharing parental authority does not extend to routine day to day matters. Neither parent should interfere on matters involving day to day care while the children are with the other parent, unless there is a very legitimate reason for doing so or where the best interest of a child is being compromised in some material way. The parties have split custody when the children divide their residential time equally or almost equally between the parents. It is generally understood to mean a division of residential time, (usually over cycles of seven or fourteen days) from a "40 / 60" up to a "50 / 50" basis. The Quebec Child Support Guidelines define shared custody as any arrangement where the children reside with one of the parents over 40% of the time. Shared custody may be imposed, in spite of opposition by one of the parents, if the circumstances show that it has a reasonable chance to succeed. It is recognized that it is in the best interest of children to maximize their time spent with both parents. Shared custody has gained popularity because it assures that children maximize their contact and time with both parents. The absence of conflict is not a requirement for shared custody. Shared custody may be a viable option, even if the parties do not get along, provided that they are both good parents with something important to offer to the children. Communication need not be perfect, only effective or functional. Difficulty in communicating is not an impediment to the imposition of split custody. Functional communication requires that you have a medium or means of communicating information regarding the children to the other party. Email is an example of such a medium, and is a good means of communication when face to face communication is not possible. A total absence of communication (where it is impossible to communicate by any means) will rule out split custody. Impeding communication to defeat split custody is an unwise strategy as it is counter-indicative to parental capacity and may result in custody being granted to the opposing party. the ability of the two parents to communicate with each other vis-a-vis the child"
In fact, split custody is viable only if the parents have demonstrated their capacity to co-operate reasonably and meaningfully in matters pertaining to raising their children. According to Dr. Richard Gardner, they must show the ability to communicate well and be willing to compromise when necessary to ensure the viability of the arrangement. The key words are co-operation and communication. According to Gardner many types of parents are poor candidates for a viable split custody arrangement. Amongst such individuals are people who cannot communicate with one another. Furthermore parents who have no basic agreement in the care of child rearing and who demonstrate a lack of co-operation in other areas are also poor candidates for joint custody. In fact, it is pointed out by Kline-Pruett and by Santangelo (1999) that for co-operation and conflict to be useful predictors, they must be more discretely defined since they are affected by other factors. However, research reviewed recently 5 does not support claims by critics of joint custody "that joint-custody children are likely to be exposed to more conflict or to be at greater risk of adjustment problems due to having to adjust to two households or feeling "torn" between parents. Split custody arrangements (whether legal or physical) do not appear, on the average, to be harmful to any aspect of children's well-being, and may in fact be beneficial." Bauserman suggests "that Court should not discourage parents from attempting joint custody". At the same time, he does point out that the results of his research do not support joint custody as preferable to, or even equal to, sole custody in all situations particularly when one parent is clearly abusive or neglectful or when it is clear that a sole custody arrangement may be the best solution. In addition, Bauserman states that in the event that one of the parents does suffer from serious emotional difficulties, children may be affected by repeated exposure to such an environment. He does point out however that in the event of extremes of parental conflict, one needs to consider that possibly split custody may be detrimental. Yet, at the same time, some research by Bender (1994) indicates that split custody may actually work to reduce levels of parental conflict over time. In fact, when couples are unable to resolve differences, when conflicts center around child custody and visitation, or when one or the other parent is unwilling to assume parenting responsibilities, forced shared custody and the resulting ongoing litigation can fuel existing conflict to the detriment of both parents and children. Hetherington and Stanley-Hagen point out "Given ample evidence of the positive association between ongoing parental conflict and ongoing legal disputes and problems in children's adjustment, the practicality of joint custody in the face of continued conflict is questionable." A minor child may have money or property that must be administered. As holders of parental authority, both parents are legally considered as tutors to their minor children. This does not change after divorce. Parents exercise legal tutorship jointly. One parent may, however, act for the other for a specific purpose with the other’s consent. Where the value of the child’s property exceeds $25,000 the Public Curator must be informed and will oversee the administration by the parents of such property. Yearly reports accounting for their administration must be submitted to the Public Curator by the parents in such cases. In the event of a dispute regarding a decision to be made by both parents in the exercise of their legal tutorship and administration of a child’s property, as in the case of disputes involving the exercise of parental authority, the court may be called upon to arbitrate. In principle children cannot decide for themselves with which parent they will reside. Children, do however, have the right to be heard in any dispute that affects their interests either directly or through an attorney. To appoint an attorney to represent a child, the child must have a sufficient level of maturity to articulate what he wants. The attorney then intervenes in the proceedings on behalf of the child, but only to ensure that what the child wants is brought to the attention of the judge. The role of a child’s attorney is not to argue what is best for the child, but only to express the child’s point of view. The Quebec Court of Appeal has held that the role of an attorney representing a child in a custody dispute is to do no more than act as a porte-parole for the child and thus to simply articulate the wishes of the child. The testimony of children as to their views and preferences, whether or not they are represented by an attorney, can be heard by a judge and be taken into account. This is most often done in private, in the absence of the parties, but in the presence of the attorneys. whether it is the result of undue influence by a parent - the Court must be assured however, that the child has expressed his or her wishes free of influence, pressure, and manipulation by either parent. The wish of a 12 year old child is "largely determinant". This means that although what the child says is not absolutely binding on the Court, it will be given very serious consideration. The wish of a child between 10 and 12 will be less influential, but nevertheless will be considered. Where children, subject to a sole custody order, express the desire for shared custody, this may be considered a significant change of circumstances opening the door to a review of the custody order with a view to determining whether shared custody is appropriate. ...... adolescent boys often seek out their fathers in an effort to understand their emerging sexuality and as a means of helping them figure out their evolving concept of maleness. ...... teenagers often respond best "when they actively participate in the creation of a (residential arrangement) routine that is dependable and consistent yet flexible enough to accommodate their emerging and emergent social life". Helping children recognize and regulate their emotions is a very important parental function. In fact, parents need to accurately identify their children's feelings and validate such feelings reflecting them back to the children so that they (a) have the experience of being emotionally recognized and responded to; and (b) begin to believe that sharing their feelings with others will lead to an alleviation of their distress "from before so that". It is painful and harmful to children and adolescents when adults misread their emotional signals and do not validate children or do not build up their self-esteem. Clearly, emotional availability and degree of warmth as well as degree of flexibility and permission are important aspects to parenting a child and adolescent. There is suggestion in the existing literature that "forcing visitations when the adolescent refuses may deepen the alienation between parent and child." Although a parent's rights to visitation are established by the Courts and although a parent is able to assert these rights, a parent needs to weigh this against the developing adolescent's need for autonomy and self-determination and consider the child's needs as well. In a custody hearing an expert may be heard to provide the Court with custody recommendations. Judges generally favour hearing the opinion and recommendations of experts in custody disputes because such evidence is considered objective and authoritative, and gives the Court reassurance as to what is truly in the best interest of the children. An expert's report is considered to be persuasive evidence. It is not, however, binding on the Court. If an expert's recommendations and opinion are not accepted, the judge must in his/her judgement explain why, and provide a valid reason. An expert's opinion will be most persuasive when the judge concludes that the expert has been neutral, objective, and has applied the correct and appropriate principles in order to arrive at his conclusions. An expert's report will be rejected when the Court has reason to question the expert's objectivity, or when it is shown that the expert's analysis is flawed in some way – that he has failed to take into account certain important facts, has misinterpreted the facts, or has erred in his application of the principles on which his report is based. To make custody recommendations an expert must conduct a psycho-legal assessment in which he interviews and assesses both parties and the children, and observes their interaction. A party cannot be compelled to submit to an assessment. However a negative inference may be drawn from a party’s refusal to be assessed. If both parents do not participate in the assessment, and for example the expert assesses the children and one of the parents only, custody recommendations cannot be made and the expert can only report on his assessment of the children and the parental capacity of the parent evaluated. Often the parties to a custody dispute agree on one joint expert and share the cost. At other times one of the parties may prefer to engage his or her own expert, in which case it may happen that each party has their own expert, there are two assessments, and unless the experts agree both testify at the hearing to convey conflicting opinions and recommendations. The parties can agree on a joint assessment by the Court Assessment Service(Service de mediation et d’expertise). The service is free. It usually takes two or three months to be referred to an expert who will either be a social worker or psychologist, and a report can be expected in about six months. In Montreal the service can be reached at 514-393-2285. One of the advantages of a private assessment, where the expert is paid, is that it generally can be completed in a much shorter period of time. A custody assessment will usually involve interviews, observation of interaction both at the expert’s office and by way of home visits, gathering of information from pertinent outside sources, and psychological testing. 11. The custodial and access wishes of the child and the child's perception of its parents. 14. Is the parent's cognitive and emotional maturity and stability appropriate to the needs of the child. collateral information derived from pertinent documents and interviews of individuals with relevant information. Of the various psychological tests available, the ones most often used and recommended are the MMPI-2 and the MCMI-III. This test is a true / false self-report inventory which is objectively scored. It consists of 175 items, which are used to evaluate behavioral patterns and personality styles. In fact, it is felt by several researchers that the MCMI is suitable for forensic assessments including custody evaluations. Personality instruments such as the MCMI can provide the psychologist with valuable information on the parents’ personality traits and any possible clinical symptomatology that may have an adverse effect on the nature of the particular environment that the parents provide for the child. One needs to recognize, however, that using the MCMI in child custody evaluations, there is no single personality trait or group of characteristics that ensures that one would be a good or poor custodial parent and consequently, these results need to be placed in the context of a complete child custody evaluation, in which direct observation can be made of parent/child interaction, in a manner which will allow hypotheses about one’s personality style in the assessment of both the strengths and deficits in parenting potential. This test consists of 133 items and employs a five point response set (ranging from “not true of me” to “true of me”). A well-functioning successful and emotionally healthy individual is one who possesses a sufficient degree of emotional intelligence and an average or above average EQ score. “On the other hand, lack of success and the existence of emotional problems are a function of the extent and degree of deficiency in the EQ score. This test assesses parents’ attitudes toward parenting and toward their children. What is noteworthy about this inventory is that it provides a quantified description of parent/child relationships that complements other assessment procedures. It helps to put qualitative impressions in perspective by making normative comparisons possible. In fact, it was felt by the author of the PCRI that it may prove especially useful in child custody settings that specifically address the needs of children. The PCRI is designed to identify specific aspects of the parent/child relationship that may cause problems and to give an overall picture of the quality of the relationship. The PCRI is divided into seven content scales reflecting the major features of parenting and the parent/child relationship as well as validity indicators. The content scales are Parental Support, Satisfaction with Parenting, Involvement, Communication, Limit Setting, Autonomy and Role Orientation. High scorers on the PCRI scales indicate positive parenting characteristics and good parenting skills, and low scores indicate poor parenting skills. This scale is a self-report measure that may be completed in different settings. It is a 45 item standardized assessment of “parents’ attitude toward parenting”. A custodial parent seeking to leave the province and change the child's residence is the equivalent of a request to change the court-ordered custody and access arrangement. To succeed a material change in the child's needs, or the parents' ability to meet those needs, must be demonstrated. A move out of the province, that was not contemplated or reasonably foreseeable when the original custody and access order was made, is considered to be such a material change. Once such an unforeseeable intention to move is shown, the focus then changes to a fresh consideration of the child's best interest in light of the move. The existing custody arrangement and relationship between the child and the custodial parent. The existing access arrangement and the relationship between the child and the access parent. The desirability of maximizing contact between the child and both parents. The views of the child. The custodial parent's reason for moving, only in the exceptional case where it is relevant to that parent's ability to meet the needs of the child. The disruption to the child resulting from his or her removal from family, schools, and the community he or she has come to know. The younger a child is the more importance the Court will place on maintaining the child's bond with the primary caregiver. The weight to be given to the maintenance of the bond with the primary caregiver decreases as the child gets older. The move must not intended specifically to prevent the non-custodial parent from exercising access. In the case of Gordon v Goertz1 the Supreme Court confirms that in a relocation case, as in all custody cases, the ultimate criterion is the best interest of the children. The principles established in Gordon v Goertz apply, as adapted, whether or not the request to move is made concurrent with an initial request for custody or in the context of a motion to modify an existing custody order. 1. The parent applying for a change in the custody or access order must meet the threshold requirement of demonstrating a material change in the circumstances affecting the child. 2. If the threshold is met, the judge on the application must embark on a fresh inquiry into what is in the best interests of the child, having regard to all the relevant circumstances relating to the child's needs and the ability of the respective parents to satisfy them. 3. This inquiry is based on the findings of the judge who made the previous order and evidence of the new circumstances. 4. The inquiry does not begin with a legal presumption in favour of the custodial parent, although the custodial parent's views are entitled to great respect. 5. Each case turns on its own unique circumstances. The only issue is the best interest of the child in the particular circumstances of the case. 6. The focus is on the best interests of the child, not the interests and rights of the parents. (g) disruption to the child consequent on removal from family, schools, and the community he or she has come to know. The decision to allow or not allow the move will thus, as always, turn on what is in the best interest of the child with reference to the move. The Supreme Court makes it clear that in the final analysis what will decide the move will be the court’s determination of where the net detriment to the children lies - in moving or staying. In the end, the importance of the child remaining with the parent to whose custody it has become accustomed in the new location must be weighed against the continuance of full contact with the child's access parent, its extended family and its community. The ultimate question in every case is this: what is in the best interests of the child in all the circumstances, old as well as new? The best interest of the children with reference to the move is therefore determined by examining the consequences of the move on them – will it be more disruptive for them to move or to stay? In terms of determining the "net detriment" to the children caused by the move, Justice L'Heureux-Dube considers that the disruption of the relationship of the children with their primary caregiver, if the children stay, outweighs reduced contact with the access parent, if the children move. Where the children are young and the moving parent has been the primary caregiver it has been consistently held that it is less detrimental for the children to move than to stay. The detriment caused by uprooting the children from their habitual place of residence becomes more significant when the children are older and their social ties and roots to the community are more developed and consequently that much stronger. In the case J. v. H. (the parties are never identified in the reporting of family cases in Quebec) the Court of Appeal permitted the move of a six year old child to France because it found that the mother was the primary caregiver (la figure parentale dominante dans la vie de l'enfant), and for that reason refusal to authorize the move would cause more disruption for the child than would less access to the father. In B. v. C.17 the Superior Court held that the best interest of a three year old child was to remain with his primary caregiver who wished to move to Moscow. He notes that where there is a stronger attachment to one parent, it is more prejudicial to the child to be separated from that parent than to see other parent less. The case of B. v. C.18 involved the move of a five year old child to B.C. by the mother. Noting that there was no evidence that the move was being made in bad faith or to distance the child from the father, Mr. Justice Louis Crête found that it was in the child's best interest to move because the mother had been the more present parent, and the more significant figure in the life of the child. Ce lien affectif constitue un gage d'équilibre et de sécurité pour l'enfant - Il favorisera son intégration dans le nouveau milieu. 48. Cela dit, les troubles de personnalité de Monsieur et l'incapacité de Madameà s'affirmer positivement envers Monsieur sont des réalités actuelles du dossier et rien dans la preuve ne suggère que cette dynamique des relations entre les parties puisse être modifiée dans un délai raisonnable. 49. Or, l'enfant souffre de ces tensions. Le tribunal ne voit pas dans la preuve d'indices d'amélioration à cet égard. Madame vit pauvrement, elle n'a pas de support familial à Montréal, elle n'a pas d'emploi et elle est soumise à la personnalité contrôlant et dominatrice de Monsieur qui agit envers elle et son fils sans empathie. La capacité de Monsieur a changé son comportement n'est pas établie ni celle de Madame a cessé ses attitudes de faiblesse. 52. Le Tribunal est convaincu que l'évolution positive souhaitée pour Madame sera favorisée dans la mesure du possible par son établissement en France ou ses conditions de vie seront nettement améliorées et ou elle retrouvera une sécurité affective et émotionnelle. Madame paraît déterminée à entreprendre un suivi psychologique qui aidera sa relation avec son fils et sera favorisée par sa famille en raison de la profession médicale de ses frère et sûr. 24. Après le divorce ou la séparation de conjoints, le besoin de réaménager sa vie personnelle ou professionnelle, se fait sentir. 25. Pour des raisons soit économiques, psychologique ou affectifs, des personnes éprouvent le besoin soit de se rapprocher de leur famille, ou de se remarier ou se trouver de nouveaux emplois ou de poursuivre des études. 26. Une analyse de la jurisprudence démontre que les tribunaux se préoccupent moins des motifs de déménagement du parent gardien d'enfant que les effets de celle-ci sur son meilleur intérêt. 27. Par ailleurs, il est reconnu que le droit de garde d'un enfant, comporte deux volets: le premier portant sur les soinsà porter à l'enfant et le deuxième, celui de décider de son lieu de résidence. 36. Il faut analyser les circonstances surtout du point de vue de l'enfant et non pas celui du parent gardien. 37. Par ailleurs, ces mêmes circonstances peuvent faire conclure que le meilleur intérêt de l'enfant est souvent lié intimement à l'épanouissement et au bonheur du parent gardien. 42. Un des facteurs dont il faut tenir compte dans les demandes d'autorisation à déménager, est l'âge et le développement de l'enfant. 43. Il est bien reconnu que lorsqu'un enfant a atteint un âge et un développement assez avancé, il s'est créé un environnement ou un milieu de lieu, d'amitiés, de parenté, de fréquentation scolaire et d'activités sportives et scolaires qui l'identifient à ce milieu. Il est plus difficile, même après avoir obtenu son assentiment, de le déloger de ce milieu, à moins de motifs sérieux. Les tribunaux considèrent alors surtout la résidence habituelle des enfants, reliée à la réalité des enfants. 44. Lorsque l'enfant est en bas âge, ce facteur intervient moins dans une telle décision parce que l'enfant s'identifie au parent et au milieu du parent gardien (primary care giver). 47. Quant à ce départ, et tout en réalisant que cet élément n'est pas crucial dans ce litige; la requérante a démontre de sérieux motifs pouvant justifier son déménagement vers son pays natal, soit Hollande. Au Canada, elle est entourée de ses parents; elle aura un emploi plus intéressant et un peu plus rémunérateur, ainsi que l'usage, à titre gratuit, d'une maison pour y loger avec son enfant. 48. L'enfant n'aura que quatre ans le 2001; donc il n'a pas encore eu l'occasion de s'intégrer pleinement dans in milieu autre que celui ou sa mère réside. La preuve révèle qu'il est heureux avec sa mère. 51. Il est toujours difficile d'accepter une décision comme celle qui doit être prise ici, parce qu'elle (et je le réalise pleinement) aura pour effet d'éloigner l'enfant de son père et de ses parents et de limiter grandement les accèsà l'enfant durant ses années de croissance et de développement. Mais considérant tous les facteurs impliqués, je ne puis empêcher la requérante de retourner dans son pays natal dans les circonstances décrites. 52. Dans le meilleur intérêt de l'enfant,à son âge, il est préférable qu'il continue à résider avec sa mère avec laquelle il a toujours vécu depuis sa naissance. C'est elle qui a toujours comblé ses besoins primaires et affectifs depuis sa naissance. In L. v. B.22 the Superior Court held that, even if shared custody were to be considered the best option under the circumstances, this would not justify precluding the move when the moving parent has been the child's primary caregiver. 9. De l'ensemble de la preuve, il ressort très clairement que nous nous trouvons ici en présence de deux jeunes parents parfaitement sains de corps et d'esprit, dont les capacités parentales ne sauraient être mises en doute. Si ce n'était de la distance qui les sépare depuis le début de la présente année, la garde partagée constituerait sans nul doute la formule la plus propice à un épanouissement harmonieux de l'enfant, ce dont l'un et l'autre conviennent d'ailleurs dans hésitation. 10. Or, même si tel n'étaient pas son but, il ne fait pas de doute que la décision de la requérante d'aller s'établir avec l'enfant dans une région assez éloignée de son milieu actuel a pour effet de rendre inaccessible la formule de garde qui aurait été la plus souhaitable dans les circonstances, en l'occurrence la garde partagée. Cela dit, recherchant pour l'enfant la solution la meilleure (ou la moins mauvaise), le Tribunal devrait-il pour autant ignorer le rôle parental prépondérant joué jusqu'à maintenant par la mère, avant comme après la rupture du couple, et confier la garde de l'enfant à son père aux seules fins de lui éviter un déracinement additionnel? 11. Comme dans toutes les décisions concernant un enfant, celle relative à sa garde doit être prise dans la seule perspective de son meilleur intérêt et dans le respect de ses droits. Le tribunal doit prendre en considération ses besoins moraux, intellectuels, affectifs et physiques, de même que son âge, sa santé, son caractère, son milieu familial et les autres aspects de sa situation (art. 33 C.c.Q.). 15. Mais J. s'en trouverait-il mieux si, pour ne pas l'éloigner de son père, de sa parenté, de sa gardienne et de ses amis actuels, le Tribunal devait lui imposer de se séparer de celle qui, tous les jours depuis sa naissance, l'a nourri, accompagné à l'école, chez sa gardienne et chez le médecin, qui l'a baigné et endormi le soir? Le présent litige soulève la question qui est peut-être la plus difficile de tout le droit de la famille, soit celle du droit de garde et de son corollaire, les droits d'accès, lorsque la décision du parent gardien de changer de résidence modifie substantiellement les droits d'accès de l'autre parent. In the case of M. v. K.(my case) Madame Justice Suzanne Tessier had to decide a provisional request for custody of a 6 year old child, together with a request by the primary caregiver to relocate from Gatineau to Kingston, Ontario. She noted the importance of the child's attachment to the mother who was her primary caregiver since birth, as well as the fact that the child had resided 70% of the time with the mother since the separation. She found that a net detriment would result for the child were she not to move with the mother. In Droit de la famille – 370233, Madame Justice Michelle Monast (yourself) had to decide a request by the mother, by motion to vary accessory measures, to move three children to Nunavut. It was held that the move was motivated by the mother's wish to remarry and form a reconstituted family with her new spouse and his children, and not to deprive the father of access. It was further held that the mother was more capable than the father to respond to the needs of the children, that she was better able to maintain the relationship between the children and their father, that the children could adapt to the new milieu, that the access proposed was generous and reasonable, as well as sufficient to maintain the existing liens between the children and the father, and thus finally because a change of custody would be more disruptive than the move. Malheureusement le déménagement va déraciner tant la mère que l'enfant de leurs îles, mail il n'a aucun rapport avec la capacité de la mère de pouvoir aux besoins de son enfant. Cette dernière a offert de maximiser dans toute la mesure du possible les contacts de l'enfant avec son père et la famille élargie. "What will he/she do if his/her request to move the child is refused? Will the move be made anyway? The Quebec Court of Appeal has held that, in analyzing what is in the best interest of the children, and more particularly the issue of where the "net detriment" to the children lies, the Court must assume that the moving parent will move with, or without, the children. Thus the Court must not take into consideration the moving parent’s testimony in relation to what he/she will do if the request to move is not granted. The Court of Appeal goes on to say, however, that should the Court reach the conclusion that the moves causes a net detriment to the children, it can then take into account the moving parent's undertaking to remain in Quebec, but only then to justify a decision not to change custody. One of the ways to mitigate the consequences of a move for the non-moving parent may be to provide for fixed access rights by webcam. Access by webcam might prove to be be “the next best thing to being there”, as the ad for long distance calling used to say. WITH work and the school week behind them, Charles A. Mason III and his daughter, Arielle, who live more than 1,500 miles apart, prepared for their scheduled weekend visit. There was no packing involved, no plane tickets, no car rides or drop-offs. All it took was some instant messaging on their home computers and a little fidgeting in front of their respective Webcams, and father and daughter were chatting, playing checkers and practicing multiplication tables. As for Mr. Mason, who lives in Warrenton, Va., the video chats are a vast improvement over telephone calls, during which his daughter -- like many children her age -- is often monosyllabic and easily distracted. As divorce has remained a constant, custody arrangements have evolved over the last half-century. Increased awareness of the toll divorce can take on children and fathers' increased involvement as parents, combined with the demands of working parents who often have to move in order to get and keep jobs, have made for increasingly creative and sometimes complex custody agreements. As the legal system begins to acknowledge the potential benefits of technology in bridging the physical and emotional distance caused by divorce and separation, more families are experimenting with computer-assisted custody sharing. Although any separating couple can opt for virtual visits in their custody agreement, debate surrounding the issue is unfolding on the state level as advocates push to have the option spelled out in state laws in order to broaden awareness of the practice and enable judges to grant such visits where they see fit. In January the Wisconsin Legislature passed a measure allowing judges to grant virtual visits in custody agreements. If Gov. James E. Doyle signs the bill, Wisconsin will become the second state officially to allow such visits, following Utah, which entered virtual visits into its state code in 2004. Efforts to push similar legislation are in various stages in several states, including Virginia, Illinois, Missouri, Florida, California and New York. But not everyone gives virtual visits a ringing endorsement. In addition to concerns that it may be used to limit in-person visits, some lawyers and noncustodial parents also worry that it may be used to bolster the case for a custodial parent's contested relocation. In 2001 an appeals court in New Jersey overruled a lower court decision denying a custodial parent's request to move out of state, reasoning that the court did not consider computer-assisted visits as an option for the noncustodial parent who objected to the move. A Massachusetts court ordered video visits in 2002 in another contested relocation dispute. The father in the case, who argued that video visits were being imposed to replace in-person visits with his children, lost his appeal to stop the move. The Utah and Wisconsin regulations specify that virtual visits should be used as a supplement to, not a substitute for, traditional visits. The Wisconsin bill also specifies that virtual visits should not be used to justify a custodial parent's relocation. The laws define ''electronic communication'' as contact by video conference, e-mail, instant message, telephone or other wired or wireless technology. ''I think that most judges understand that children require physical one-on-one contact with the absent parent,'' said Cheryl Lynn Hepfer, president of the American Academy of Matrimonial Lawyers. Mr. Mason, who sees Arielle in person over spring and summer breaks and alternating holidays, said virtual chats allow him to maintain a comfortable rapport with his daughter between visits. At one point during a recent call, Arielle repositioned the camera toward her piano keyboard and played him a few songs she had learned. Vada Dreisbach, Arielle's mother, said she maintains control of the Webcam and the passwords for logging on to the necessary computer programs. She also has the computer set up so that Arielle can receive instant messages from only her father. She logs her daughter on and off before and after each visit. Despite the demand for long-distance custody arrangements, those who support virtual visitations say it is an option that is still relatively unknown. Some lawmakers and lawyers said legislation is needed, if only to raise awareness among lawyers. State Senator Jay O'Brien of Virginia said he introduced virtual visiting legislation this year after witnessing a divorced relative's difficulty with trying to see his children. His bill failed to pass Virginia's Senate Courts of Justice Committee, which decided that since there was nothing expressly barring virtual visits, there was no need to permit it officially. John M. Speer, a financial consultant in Palm Valley, Tex., says he could benefit from state involvement. Though technically permitted by the terms of his custody agreement to visit with his three children every other weekend, such visits have become financially prohibitive since he moved from the Chicago area, where his children live, to Texas in 2001. Because his ex-wife, he said, has yet to approve his requests for Web visits, having the option of such visits written into Illinois statute would allow a judge to approve the visits over her objections. Michael Gough, who successfully lobbied for the Utah provision after his ex-wife and daughter, who was 4 at the time, moved to Wisconsin in 2003 and led the advocacy effort for the Wisconsin legislation, is working with lawyers and noncustodial parents around the country to push for similar legislation in other states. Mr. Gough, a computer security consultant, runs a Web site called www.internetvisitation.org, which tracks legislation, offers divorce resources and gives user testimonials. He also runs a how-to site called www.videocalltips.com that walks users through the mechanics of video conferencing and rates software and Webcams. Still, some families have found virtual visits more hassle than they're worth. When Alex Tomaszczuk moved to California in 2004, he bought a Webcam for himself and one for his ex-wife and children, who remained in Virginia. The image on the screen broke up if the kids moved around too much, and coordinating visits around the three children's busy schedules proved difficult. ''In some respects it's just easier to pick up the cellphone when I'm on the freeway and talk to them for 45 minutes,'' said Mr. Tomaszczuk, 50, a government contracts litigator who still works from Virginia part time and sees his children in person at least twice a month. Jim Buie and his son Matthew struggled with myriad technical problems when they began experimenting with video visits in 1999. Matthew, then in high school, was living with his mother in North Carolina, and Mr. Buie was living in Maryland. But as the technology improved, Web visits became a cherished link between father and son, and they continue them, even though Matthew is now 22. Matthew, who directs audio systems for a cruise line, took a break in a cafe in Aruba during a recent Caribbean cruise to check in with his dad via Webcam. The two chatted about Matthew's forthcoming cruise schedule and joked about the bold Caribbean shirt he was wearing. Mr. Buie remarked that he still had not met his son's new girlfriend and asked him to bring her along for an introduction on their next virtual visit. (2) Where a count charges an offence under subsection (1) and the offence is not proven only because the accused did not believe that there was a valid custody order but the evidence does prove an offence under section 283, the accused may be convicted of an offence under section 283. R.S., 1985, c. C-46, s. 282; 1993, c. 45, s. 4. (2) No proceedings may be commenced under subsection (1) without the consent of the Attorney General or counsel instructed by him for that purpose. R.S., 1985, c. C-46, s. 283; 1993, c. 45, s. 5. 284. No one shall be found guilty of an offence under sections 281 to 283 if he establishes that the taking, enticing away, concealing, detaining, receiving or harbouring of any young person was done with the consent of the parent, guardian or other person having the lawful possession, care or charge of that young person. 1980-81-82-83, c. 125, s. 20. 285. No one shall be found guilty of an offence under sections 280 to 283 if the court is satisfied that the taking, enticing away, concealing, detaining, receiving or harbouring of any young person was necessary to protect the young person from danger of imminent harm or if the person charged with the offence was escaping from danger of imminent harm. R.S., 1985, c. C-46, s. 285; 1993, c. 45, s. 6. 286. In proceedings in respect of an offence under sections 280 to 283, it is not a defence to any charge that a young person consented to or suggested any conduct of the accused. Where a child has been unlawfully removed from the place of his “habitual residence” and taken to Quebec the Loi sur les aspects civils de l'enlevement international et interprovincial d'enfants, L.R.Q., c. A-23.01 may be relied on to obtain the child’s return, the principal being that the custody of the child should be decided before the court of the place of his “habitual residence”. The law provides that the aggrieved parent may ask the Quebec Superior Court to order the return of the child to the jurisdiction from which the child has been taken, so that a proper custody hearing can take place in the jurisdiction from which the child was removed. The parent asking for the return of the child must initially satisfy the Court that the Loi sur les aspects civils de l'enlevement international et interprovincial d'enfants applies. This requires proof that there has been an “unlawful removal”, or by showing that at the time of the removal a “right of custody” was being exercised that has been violated, and also that the child’s “ habitual residence” is that of the place to which the request for return is being made. A “right of custody” refers to the exercise of parental authority, and more particularly to the right to decide the child’s place of residence. The “habitual residence” of the child is determined by looking at the reality for the child, and not by trying to ascertain the intentions of the parents as to their place of residence. It is important to act quickly as a new habitual residence may be acquired if a period of time has elapsed of a duration necessary for the child to have developed ties with, and to have shown signs of integration into, his new environment. Once it is shown that there has been an unlawful removal and that the Loi sur les aspects civils de l'enlevement international et interprovincial d'enfants applies, the burden shifts to the removing parent to prove that one of the exceptions outlined in the statute to the return of the child applies. The most commonly pleaded exception is that the return of the child will place him at risk or in an “intolerable situation”. This will be the situation if it can be shown that returning the child will subject him to a risk of substantial psychological harm. In Quebec, as in the rest of Canada, child support has been “defiscalized”. This means that it is neither taxable to the recipient, nor tax deductible to the payor. The amount of child support payable in Canada is determined according to Guidelines that have been established by the Federal and provincial governments. There are two sets of guidelines that are used depending on the residence of the parties. The Federal Guidelines will apply if the debtor ordinarily resides outside of Quebec. The Federal Guidelines for the province where the debtor resides will apply. If the debtor does not reside in Canada it is the Federal Guidelines for Quebec that apply. If both parties are Quebec residents the Quebec Guidelines will apply. “Gross income” from all sources, both direct and direct, is used for support determination. This means that all amounts received directly, and all benefits received indirectly, must be included in the calculation of the amount of income for the application of the Child Support Guidelines. What a person declares to the tax authorities for income tax purposes is relevant and indicative, but is not always conclusive for purposes of determining his capacity to pay support. Gross income declared for tax purposes may not include all of a person’s sources of income. It often happens that a person's real income includes amounts that are received indirectly, or are received directly but are undeclared, and thus are not included in his taxable income. Indirect payments may take the form of benefits consisting of “perks”, including the payment of personal expenses by the payor’s employer, or the payment of monies to a holding company or trust designated by the payor. The debtor may also be recipient of direct undeclared cash payments. Indirect payments most often occur when a payor is self-employed and can control how he is paid, and how much he is paid directly. An employee may receive a benefit, in the form of a payment of a personal expense that is made on his behalf by his employer, or a corporate entity that he directs. In such a case he benefits personally by having an expense, which he would otherwise have to pay with gross pre-tax dollars, paid on his behalf with dollars on which he has no tax liability. Such payments are deducted by the employer as business expenses while the employee may not include the value of the personal benefit derived in his income. For purposes of support determination the net dollar value of the benefit is “grossed up” or raised to its pre-tax value, and it is the gross value of the benefit that is added to the employee’s income. As an example - a person earning $100,000 per year is in the 50% tax bracket. Every dollar paid out on his behalf in personal expenses when grossed up to its pre-tax value must be doubled and is thus worth $2. Thus when calculating a person’s income for support determination purposes a payment of a personal expense such as a restaurant meal or a car payment of $100 must be doubled to $200. Undeclared or cash income that can be proven is considered as well for support determination as net income that must be "grossed up" to its pre-tax value. Thus what a person declares to the tax authorities for income tax purposes is relevant and indicative, but is not conclusive for purposes of determining capacity to pay support. Gross income declared for tax purposes may not include all of a person’s sources of income. For example it will not include personal expenses paid for that person by his company or employer. There may also be deductions taken to calculate a person’s taxable revenue, such as depreciation of physical assets, which are not pertinent for purposes of support determination. If it concludes that income has been hidden, and it is impossible to specifically quantify the amount in question, the Court may arbitrarily determine a person’s income for support determination. This means the Court will simply fix the level of income to be used, whether or not the figure is accurate in reality. In such a case the dishonest party will only have himself or herself to blame. If it is proven that a party has voluntarily abandoned a revenue generating activity, in the case of a support debtor to avoid the payment of support (for example by taking voluntary early retirement) or in the case of a support creditor (for example by leaving employment to return to school) to increase the amount of support payable, the Court will deem that the activity never ceased and make its support determination as though the debtor’s income has not changed. The gross incomes of both the custodial and non-custodial parents are considered in determining the respective percentage contributions of the parties towards the child support obligation. In other words, the gross incomes of both parents are considered in assessing both the quantum of child support and the distribution of that obligation pursuant to the formula used under the Quebec Guidelines. The formula used under the Quebec Guidelines results in a basic table amount payable in child support (to which certain other expenses, discussed below, may be added). Under the Quebec Guidelines, the "time of custody" (and, of course, the number of children), are used to determine the amount of child support payable. The Quebec Guidelines factor in one of the above custodial scenarios in distributing the child support obligations to each of the parents. Accordingly, child care costs are recognized by a parent where that parent has at least 20% residential custodial time. The Quebec Guidelines also take into account hybrid situations where, for example, there is more than one child, and where the "time of custody" with each parent varies based on the three categories referred to above; for example each parent may have custody of one child, or one child may be in a shared custody situation while another may be subject to a "prolonged access" arrangement, etc. You will note from the second page of the '€œChild Support Determination Form'€ used by the Court (Schedule 1 to the '€œRegulation respecting the determination of child support payments'€, c.C-25, r.1.2., and attached as Appendix '€œA'€), and supported by the '€œAliform'€ software widely used in Quebec to calculate child support (www.cch.ca/produit.aspx?webid=1021), that the contribution of each party to supporting the children is based on a percentage (called the distribution factor) of the total "disposable" income of the parties. The percentage of after tax income devoted to child support under the Quebec Guidelines is on a declining percentage. 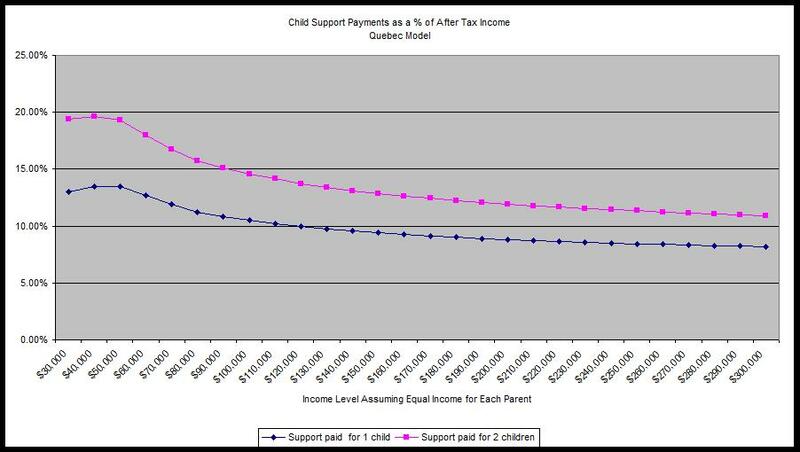 In other words, the child support paid, as represented by the percentage of after tax income, decreases as after tax income increases (although the overall amount of child support, of course, increases). This declining percentage is illustrated in Table 1 and Figure 1 (below). The figures presented in Table 1 and Figure 1 assume that one parent has sole custody of one or two children (i.e. over 80% of residential custodial time), and that both parents earned equal incomes (for child support purposes) resulting in equal proportions of contribution to the child support. The figures presented in Table 1 and Figure 1 represent the non-custodial parent's 50% share (as each parent is paying half) of the Quebec Guidelines child support basic table amount. The basic table amount payable is derived from a calculation that includes a '€œBasic Deduction'€ of a self support reserve of $10,100 for each parent, and the deduction reduces the total income deemed available to each parent for the purposes of calculating child support, and below which amount no child support would be payable by a parent. (1) '€œIncome Level'€ represents gross income before any taxes or deductions. (2) '€œAIT Income'€ represents the after tax income available to a parent following requisite federal and provincial taxes, Unemployment Insurance ('€œEI'€), Canada Pension Plan ('€œCPP'€) and the Quebec Provincial Parent Insurance Plan ('€œPPIP'€). The maximum payable on CPP is $2,163, the EI maximum in Quebec is $588 and the PPIP maximum is $316. (3) For '€œCombined Disposable Income of Parents for Child Support Purposes'€ ('€œCombined Income for Support'€) in Table 1, it is assumed that each parent earns an equal amount, which amount is specified in the first column as '€œIncome Level'€. From Income Level, for establishing income for child support purposes, each parent is allowed a '€œBasic Deduction'€, as a self support reserve, of $10,100. Accordingly, the Combined Income for Support for the assessment of the basic table child support is the Non Custodial Parent Income Level times 2 minus $20,200 ($10,100 x 2). (4) The child support amount utilizes the 2010 table and then the amount is reduced by 50% to reflect the non-custodial parent's share, pursuant to the equal income assumption. (5) The child support payable as a percentage of AIT Income. An additional factor which may increase the amount of support are certain specified expenses (called "special" or "particular" expenses) relating to the child which are not considered to be part of and calculated in the base amount of support Such expenses include net child care expenses, net post secondary education expenses, and net special expenses. The calculation of both the net child care and post secondary education expenses require the deduction of any benefit, subsidy, or income tax credit applicable before the net cost is allocated between the parents. In addition, the parents' contribution to post secondary education expenses is also net of any student loans or bursaries the child receives. Net special expenses are expenses other than child care or post secondary education costs necessary to meet a particular child's situation. This can include expenses for medical issues, elementary or secondary education, and extra-curricular activities. Related benefits, deductions or income tax credits are deducted from such expenses before being allocated to the parents. If the parents cannot agree on the add-ons to the basic table amount, then they must be approved by the Court on the basis that the expenses are reasonable given the needs and resources of each party. Special or particular expenses are routinely added to the base amount of support to obtain the total amount of support payable, if the support creditor satisfies the Court that the expense claimed falls within what has been accepted. For example day care required for work is always accepted. Private school expenses are accepted if the parties had agreed on private school - if there is a disagreement then the Court must determine if private school is reasonable based on the circumstances of the parties. If the Court concludes in the affirmative then what is acceptable as a private school expense will be added on. It should be pointed out that not all school expenses are accepted 100% of the time. I have seen decisions where, for example, uniforms are accepted by one judge because they are required by the school, but not accepted by another because it was determined that they are covered by the base amount that provides for clothing. The same can be said about activities. Some judges accept the addition of expenses associated with activities. Others find that activities are covered by the base amount and only the participation in sports at an elite level will allow the addition of expenses associated with the practice of that sport as a special expenses. In my practice I have found that judges are less generous when it comes to discretionary add-ons when the parties are less fortunate and do not have the financial capacity to sustain the additional costs. The percentage in the table in Schedule II for the part of the parents' disposal income exceeding 200 000 $ is given for information purposes only; therefore, the Court may, if it deems it appropriate, fix for that part of the disposable income an amount different from the amount that would be obtained using that percentage. Accordingly, the Court may depart from the Quebec Guidelines formula percentage where it deems it appropriate where the combined disposable income of the parents exceeds $200,000. The Court will normally exercise that discretion, based on my experience, when the evidence clearly shows that the payer's capacity to pay is exceptional - in other words where his/her income is at a level where the amount determined by using the Guidelines would be substantially less than what would be ordered if the old test consisting of balancing needs and means were to be applied. Second, that discretion is also defined in article 587.2 of the Civil Code of Quebec (attached as Appendix '€œC'€). In relation to derogating from the Quebec Guidelines amount, the rule is that the Guidelines amount will apply unless the parties show cause why it should not apply. In practice, the parties can always agree to an increase over the Quebec Guidelines amount which the Court will not hesitate to accept, but cannot bind the Court by an agreed decrease unless certain conditions are satisfied. The same conditions will apply if the parties do not agree and one of them requests an increase or decrease of the Guidelines amount. Article 587.2 (second and third paragraphs) of the Civil Code of Quebec indicates when and why the Court may, on a discretionary basis alone (there being no formula to apply), increase or reduce the level of support determined by the Guidelines. Article 587.2(2) allows a deviation from the formula amount based on simple hardship. The situations where simple hardship is sufficient to displace the formula amount includes where the parent seeking the variation has an obligation to support other children. Article 587.2(3) allows a deviation from the formula amount only where there is '€œundue hardship'€. The situations in which undue hardship must be shown includes where there are high costs of exercising visiting rights with the children or where there are obligations to support persons other than children. 587.2(2) The court may, however, increase or reduce the level of support where warranted by the value of either parent's assets or the extent of the resources available to the child, or to take account of either parent's obligation to provide support to children not named in the application, if the court considers the obligation entails hardship for that parent. 587.2(3) The court may also increase or reduce the level of support if it is of the opinion that, in the special circumstances of the case, not doing so would entail undue hardship for either parent. Such hardship may be due, among other reasons, to the costs involved in exercising visiting rights in respect of the child, an obligation to provide support to persons other than children or reasonable debts incurred to meet family needs. It has also been established by the jurisprudence that the Quebec Guidelines amount may be increased (the French term being majoré) if the non-custodial parent does not exercise access, provided that the custodial parent is able to show that such non-exercise of access imposes additional costs for him/her. Regarding simple "hardship", based on my experience, the Court will look at the payer's income and expenses, including those associated with other children, (either from his new family or those that he must support by virtue of a previous child support order) and determine whether, taking into account the Guidelines amount obtained, there is enough income left over for the payer to meet his obligations to the other children that he must provide for. The Court will exercise its discretion based on the principle none of the payer's children should receive preferential treatment in relation to the others. "Undue hardship" as the term suggests relates to more than simple financial difficulty. It must be demonstrated that the imposition of the amount obtained by applying the Guidelines will for example clearly leave the payer without sufficient means to pay the costs associated with the exercise of his access, rendering his access rights illusory (particularly where the child resides at a considerable distance necessitating exorbitant travel costs), or where the payer is the sole source of support for an elderly parent, a handicapped wife etc., or where the termination of the marriage has left the debtor with the responsibility for the payment of debts that have their origin in family expenses of a reasonable nature. In these cases there would appear to be a requirement to show that the payment of the Guidelines amount of support in addition to the payer's other obligations referred to will leave him without sufficient means to support himself and meet his current obligations. In my experience, the Quebec Guidelines have proven to be very workable on a practical level since they were introduced in 1997. There is software available (Aliform, referred to above) that calculates the amount of support payable once the necessary information as to income, the custodial arrangement, and any special expenses is properly entered. This software is widely used in Quebec, and has proven to make the calculation of child support and the distribution of that obligation between the parents quite simple. In any event, it is my view that Quebec Guidelines and their application have not been complex for either the parties involved, their counsel, or the Court. The litigation that has ensued in the application of the Quebec Guidelines mostly concerns determining income (particularly when one of the parties is self-employed or earns undeclared income), making the calculation of the time of custody (in hours and then days) when the exact periods of access are unclear, calculating special expenses (which ones apply and what are the net amounts applicable), and claims regarding derogating from the Guidelines amount - not to mention, of course, custody litigation itself which is often required before a determination of the "time of custody" can be made. To calculate residential time the number of days per year that the child spends with each parent must be calculated. Since fractions of days are to be included in the calculation, the Courts have held that counting the total number of hours in the year that the children spend with each parent, and then dividing by 24 to obtain the number of days per year, is the most accurate way to determine residential time for the application of the support Guidelines. There are 8,760 hours in the year (365 days x 24 hours per day). In 1999, it was settled by the Supreme Court of Canada that child support may be claimed from a non-biological parent, if that person has voluntarily assumed the role of a father or mother to the child. This is what in law is referred to acting in loco parentis. A claim for support against a non-biological parent is not lost because the biological non-custodial parent is already paying support. In such a case the obligations of the biological and non-biological non-custodial parents become solidary, meaning that support may be claimed from either or from both. If a child who is 18 years or older resides at home, and remains dependent, the parent with whom he or she lives may apply for child support from the other parent. Child support does not automatically stop when a child turns eighteen years of age. A child of the age of majority may remain financially dependent as a result of being a full-time student. Child support in such a case may continue through CEGEP (junior college), and beyond if the child attends university. The Courts accept a university education today as a necessity for obtaining and maintaining gainful employment. It is no longer considered a luxury. A student's right to continue to claim support from his or her parents after 18 years of age has its basis in the obligation of parents to provide education. It must be shown that the student's parents have the financial means to contribute. The level of education reached by the parents is also considered. If the parents have a university education the courts consider that it would be unfair to deny the same opportunity to the child, provided that the parents have the means to pay. To be entitled to claim support a university student must demonstrate that he or she is pursuing a serious course of study. This depends on the practicality of the chosen field of study, the student's regular attendance in classes, and the obtaining of passing grades. An isolated failing grade will not be a bar to continuing support. The child must contribute to minimizing his needs, in collaboration with the parents, by working during the summer and applying for all loans and bursaries for which he is eligible. However, if the parents clearly have the financial means to assure the child a university education, the court will usually not insist that a student borrow and incur debt to provide for his or her needs. Support for a university student need only be paid during the academic year, and not during the summer when a student can obtain summer employment. The notion of costs in relation to studies is interpreted largely, and may include tuition, transportation, books, and materials. In the case of a child of the age of majority, there is only a presumption that the Guidelines apply. The Court is not bound to apply the Guidelines, and has the discretion to determine a different amount of support. This means that the Child Support Guidelines do not automatically apply, but only serve as a guide. The Guidelines amount is normally used as a point of reference from which to start. From there, amounts are either added or subtracted, depending on the circumstances, to arrive at the amount awarded. As examples - the Guidelines amount has been reduced. -by the amount of loans or bursaries that a student has obtained. A child who resides with neither parent must act on his own to claim support. When a child over 18 years of age acts on his own to claim support from one parent or both, the provisions of the Civil Code of Quebec apply, and not the Child Support Guidelines, with the consequence that if support is awarded it is on a gross pre-tax basis (as in the case of spousal support). It should also be noted that once a child over 18 ceases to reside with the parent to whom child support is being paid, the payer of support should apply to the Court to cancel his obligation to pay support to that parent and for authorization to pay the child directly if the child remains a student. Spousal support is either “compensatory” or “non-compensatory” in nature, or both. Compensatory support is due when it is determined that the recipient has suffered financial disadvantages as a result of the marriage and/or its breakdown. As an example, a spouse will be considered disadvantaged by the marriage if he or she has interrupted a career and remained off the labour market to stay at home and care for children. A spouse may be considered disadvantaged by the breakdown of the marriage if the marriage provided financial benefits that effectively ceased with the separation. Non-compensatory support is based on the social obligation that marriage produces requiring the spouses to assist each other financially. Such an obligation exists independently of the obligation to compensate for financial disadvantages having their origin in the marriage or marriage breakdown. An example would be where one of the spouses has been financially autonomous, but then becomes ill and can no longer work. At the time of the divorce it would be an unfair consequence of the marriage breakdown to terminate the financial assistance which the marriage would have entitled the disabled spouse to continue to receive, simply because the parties are divorcing. Periodic spousal support (e.g. weekly or monthly payments etc.) based on a written agreement or court order is taxable to the recipient, and tax deductible to the payer. When the debtor is a salaried employee, and is paying spousal support by written agreement or court order, it is important to ensure that his or her deductions at source be adjusted to obtain immediate effect of the reduced net cost of such payments. Support may also take the form of a lump sum payment. Lump sum payments are granted to fulfill specific alimentary needs, which may include the purchase of a home or car, the payment of a debt etc. A lump sum is also considered appropriate as an up front payment of support to achieve what is called a "clean break" between the parties. Lump sum payments are neither taxable to the recipient, nor deductible to the payer. The determination of spousal support is based on the financial "means and needs" of the parties. Its purpose is to ensure, as much as is possible, the financial resources required to maintain the lifestyle enjoyed by the recipient spouse during the marriage. The same principles apply to calculating income for payment of spousal support as those referred to above for purposes of the determination of income for the calculation of child support. Like the debtor, the spousal support creditor will be asked to complete a form referred to as a “Statement of Revenues and Expenses”. The creditor’s net revenues - gross income MINUS income taxes - is first calculated. This provides the creditor’s net disposable income. The creditor’s expenses (which are expressed in net dollars) are then subtracted from the amount of total net income. If the result is negative, meaning that there is a deficit, this usually means that spousal support is required as it is proof that the creditor does not have the means to pay his or her expenses. To determine the amount of spousal support necessary to offset the shortfall, the net deficit is “grossed up” to its pre-tax value. This provides the amount that the creditor must claim. It is important to note that the amount to be claimed is always expressed in gross, pre-tax dollars. Thus while the deficit is expressed in net after tax dollars, spousal support is payable in gross before tax dollars. The amount of spousal support that should be claimed is therefore the gross dollar equivalent of the amount of the net deficit. It is very important that the creditor’s expenses be stated on the list of expenses in realistic figures and that they are not inflated. Only then will the amount of support claimed be reflective of the lifestyle that can reasonably be expected based on the total revenue that is available to the family. At the final hearing the amount of spousal support payable will be determined by the Court after it is decided how the assets subject to the family patrimony and matrimonial regime will be divided (see below). This means that the needs of the recipient will be looked at taking into account the benefit derived from the division of property that is made by partitioning the assets subject to the family patrimony and matrimonial regime, and thus the capital amount or assets that are received by the support creditor. One of the court's objectives in making a spousal support order will be to promote the economic self-sufficiency of the creditor spouse within a reasonable delay, when this is possible. Self-sufficiency is usually possible when the creditor is relatively young, in good health, is available to work, and either has skills or has had skills in the past. A "transitional period" is often required to allow time for recycling or re-training. Re-training may take the form of brushing up on old skills. Recycling involves acquiring new skills. Recycling will be allowed at the expense of the other party, and support fixed accordingly, if the creditor can prove that there is a link between his or her state of dependence (i.e. the need to re-train to acquire employment) and the marriage. As an example, a link of this nature will be found if the creditor spouse left the labour market during the marriage to care for the children with the agreement (express or implicit) of the other party. It should be noted that the court may not tolerate a decision by a creditor spouse, who already has skills and is employable, to recycle in order to change careers. This is not a case where recycling at the time of the marriage breakdown is necessary, and is the result of a personal choice. In such circumstances it is considered that the debtor spouse should not be obliged to assume the costs of such a personal choice by the creditor spouse. Is it possible to avoid financial disclosure by simply admitting one’s capacity to pay the amount of support claimed? On the first page of the Statement of Revenues and Expenses which must be completed by both parties where there is a claim for spousal support, there is a textbox that can be checked off allowing a support debtor to admit his capacity to pay the amount of support claimed, while denying the right of the creditor to claim that amount, and thus avoid a detailed financial disclosure. Such an admission is possible, however, only in the case of a claim for spousal support, and it would be done in order to avoid the filing of the required Statement of Revenues and Expenses in which a sworn disclosure of all sources of income and assets, whatever they are and wherever they are, is required. In the case of the Child Support Determination Form there is no equivalent textbox allowing for an admission of a debtor's capacity to pay. This is because child support is calculated based on the Guidelines in which the income of the parties is a key variable in the equation, and in which the net worth of the debtor may become a factor if there is a claim that support be granted beyond what the Guidelines provide for. Making an admission of capacity to pay might be done by a support debtor to avoid intrusion into his financial affairs, where the amount claimed is less than what the debtor believes he might have to pay if his income and his net worth were disclosed and became known. The Court can, however, in spite of such an admission and on request of the support creditor, make an order that a full disclosure be made. This would be the case when a full disclosure is necessary in order to ensure a complete solution of the issues in the case. A recent case that I pleaded illustrates the danger of an admission of capacity to pay. The husband had a very substantial net worth, in the millions. The wife was claiming child support and spousal support. She had no idea of what the husband's specific financial means were, nor what his net worth was. She had no choice but to guess, and completed the Child Support Determination Form by attributing an income of $500,000 per year to the husband and calculating her claims for child and spousal support accordingly. The husband had reasons for not wanting to make any disclosure, and replied by admitting the amount of yearly income attributed to him. Basically he said "if my wife says that I have an income of $500,000 per year, then this is what it is". He asked to be relieved of the obligation to file a Statement of Revenues and Expenses on the basis of this admission. The Superior Court ordered the husband to make a full disclosure and file a completed Statement of Revenues and Expenses and supporting documents, consisting of his tax returns for the last five years. The Court reasoned that, given the circumstances of the case, only a full financial disclosure would enable the judge to arrive at a complete solution and determine what would be fair and equitable in terms of spousal support. The Court added that the husband was obliged in any event to file a Child Support Determination Form with all of the required information. This decision was confirmed in the Court of Appeal. All alimentary pensions are subject to indexation on January 1 of every year by law in accordance with the rate fixed by the government. * NOTE: The above table is for informational purposes only. All efforts have been made to ensure the accuracy of the data in the following table, but neither Andrew H. Heft nor any representative of his assumes any responsibility for the accuracy or reliability of the data. Anyone relying solely to this table assumes all responsibility of the consequences of this use. Generally a support order may be modified when there is an important change in any factor that is determinant of the amount payable. In the case of a support order based on an agreement (as opposed to a determination by a judge) the change must relate to something that was unforeseen at the time that the agreement was entered into – such that it can be said that had the new situation been known then the parties would have made a different agreement. In other words there must exist a significant change in the situation of the parties in relation to a matter that could not have been reasonably foreseen at the time of the negotiation of the agreement. It is important to ensure that information about the revenues of the parties is exchanged regularly – in the case of child support at least once per year after the filing of tax returns. Since May 1, 1997, under the Act to Facilitate the Payment of Support, the Minister of Revenue of Quebec is charged with the enforcement of support orders and the collection of both spousal and child support. Lawyers were initially removed from the collection process. The Court of Appeal subsequently confirmed however that, if they so choose, support creditors have the right to use lawyers to collect outstanding support payments. All support orders are automatically registered with the Minister of Revenue of Quebec. This means that the support debtor makes his payments to the Minister of Revenue and the support creditor receives her payments from the Minister. Thus, by the application of the Act there are no more direct relations between the parties regarding the payment of support. In practice it usually takes about one month after an order for the Minister to begin its collection procedure. For judgments rendered prior to May 1, 1997, in the event of default in order for the Act to Facilitate the Payment of Support to apply and for the Minister to intervene and impose its collection procedures, the support creditor must register the default with the Minister. Generally, where a debtor is employed, the support payments due are automatically deducted from his pay cheque in the same manner as his deductions at source. Where the debtor is self employed the Minister will issue an order to remit the amount payable as the support payments become due. Failure to comply will result in seizure, assuming that a self-employed debtor has assets that are apparent and can be seized. Problems may arise where a self-employed debtor’s assets are not apparent or easily traceable. In practice the Ministry of Revenue has demonstrated that it does not have the time or resources to do the detailed investigation that is often required to uncover hidden assets. This is where it would be advisable to pay an attorney to collect what is owing. It is important to point out that the parties to a support order can ask the Court for an exemption from the application of the Act to Facilitate the Payment of Support, and deal with each other directly. To be granted the exemption the support debtor must deposit security with the Minister, usually equivalent to three months worth of support payments. If there is a default, and the creditor registers the default with the Minister of Revenue, the Act to Facilitate the Payment of Support will take effect, and with the security deposit the Minister will have funds to pay the support creditor for three months while it gets its collection process into gear. It may happen that a debtor transfers assets, which could be used to satisfy a claim or judgment debt against him, to a third party, and thus attempts to hide his assets or to make himself appear unable to pay or insolvent. A person is insolvent when his liabilities exceed the value of his assets. If the transfer is made for a price which is less than the fair market value of the asset (the asset is disposed of for less than it is worth), and the debtor is insolvent at the time or the transaction renders him insolvent, the court will deem it to be made with intent to defraud and it will be set aside on application or declared unopposable to the creditor. This means that if the application is granted the creditor may act as though the transaction never took place and seize the assets in the hands of the third party transferee. If the transfer is made for fair market value it may still be set aside if the debtor is insolvent or the transaction renders him insolvent, and the third party transferee knows of the debtor's insolvency. In such a case the transaction is also deemed to be made with intent to defraud and will be set aside on application and declared unopposable to the creditor. A third party transferee who is "related" to the debtor (the debtor and third party are not dealing with each other “at arm's length”, such as a husband and new wife) is deemed to have knowledge of the debtor's state of insolvency. Otherwise knowledge of insolvency must be shown for intent to defraud to be proven. An action to declare a fraudulent transfer unopposable must be brought within one year of the date when the creditor acquires knowledge of it. In family cases, a support debtor will be found to be in contempt of court where there is a clear order providing for the payment of financial support and it is deliberately ignored. The hearing of a charge of contempt of court in a family case follows the rules that apply to penal or criminal proceedings. The accusation of contempt must be proven beyond a reasonable doubt. This is the only time in a civil case where the burden of proof exceeds the normal requirement that the plaintiff prove his case by a balance of probabilities i.e. - more probable than improbable. Because of the extraordinary nature of the burden of proof in a contempt hearing, the Courts have held that no other proceeding, such as a motion to modify a support order, may be heard at the same time and before the same judge. The two proceedings must be heard separately and on different dates. 1) Firstly the Petitioner must prove first that the Defendant has violated a court order - that there is an order, that the Defendant had knowledge of the order, and that the Defendant has not complied with the order. 2) if such proof is made, it is then up to the Defendant to provide an explanation for his failure to comply with the order. 3) If an explanation is provided, the burden shifts back to the Petitioner to prove the falsity of the explanation, or if the explanation is true that it is insufficient to justify the Defendant's failure to comply. It is not a defence for the Defendant to argue that he never had the means to pay. This would put the order itself into question. To plead an incapacity to pay, the circumstances must relate to events or facts that occurred subsequent to the order that is the object of the contempt citation. It is a defence to plead that the issuance of the contempt motion is not a proceeding of "last resort" - i.e that the creditor did not exhaust his/her recourses before resorting to a contempt motion. The "last resort" defence will not apply, however, where execution proceedings would be useless because the debtor has rendered himself "judgment proof" or has acted fraudulently by hiding his assets. If found guilty the penalty may be a fine and/or imprisonment. In family cases, particularly in the case of deliberately defaulting alimentary debtors, or debtors who structure their financial affairs in such a manner as to render themselves judgment proof, the Courts routinely impose prison sentences where it appears that the imposition of a fine will prove useless. The sentences handed out have been as high as six months. A common practice is to order a term of imprisonment and at the same time provide that the debtor can avoid incarceration, by paying the arrears of support owing. This can be effective on a practical basis. In a recent case that I pleaded this kind of a sentence was ordered, and when the police went to execute the arrest warrant the debtor suddenly found the money to pay the arrears of child support due, which up to that point had been accumulating for two years. One party can be ordered to pay the legal fees and costs of the other. This is called a “provision for costs”. A provision for costs is most often awarded when there is gross discrepancy between the financial means of the parties in order to level the playing field and thus to assure the protection and exercise of the rights of the financially disadvantaged party. A provision for costs may be awarded at any stage of the case, and there may be several provisions for costs awarded if the circumstances so warrant. As with financial support the issue is one of means and needs - the means of the party who is paying and the needs of the party who is asking that his or her fees be paid. The Court usually requires a detailed estimate of anticipated fees and disbursements, including experts' costs. There are many specific reasons that justify a provision for costs such as the nature, seriousness, and importance of the proceedings, the anticipated duration of the proceedings, the good or bad faith and behaviour of the parties, whether the rights of children are in issue etc. The Courts do not favour granting a provision for costs if its effect will be to finance or fuel unnecessary litigation or what has been described as “judicial guerrilla warfare”. "Prenuptial agreements" do not exist under Quebec law. In Quebec you have the option to choose between the two matrimonial regimes of separation as to property and partnership of aquests. These two regimes are intended to determine how your marital property will be divided at the time of divorce. Your matrimonial regime will determine how the assets that you and your spouse acquired during the marriage are to be treated, with the exception of the assets subject to the family patrimony which are divided according to the "family patrimony" provisions of the Civil Code of Quebec. If you are married outside of Quebec and made a pre-nuptial agreement in the place where you were married, it will have no effect in Quebec if it conflicts with the legal matrimonial regime of the place where you and your spouse were domiciled (intended to live) at the time of the marriage. Under Quebec law assets acquired after the marriage (with the exception of family patrimony assets) are divided on the basis of the matrimonial regime of the place where you were domiciled at the time of the marriage. A pre-nuptial agreement cannot supplant (take the place of) either the family patrimony law or the rules applicable to the matrimonial regime chosen, both of which sets of rules are of "public order". This means that you cannot agree that the family patrimony law or the rules applicable to your matrimonial regime will not apply at the time of divorce and that a different set of rules will apply. In Quebec, at divorce or in the case of legal separation, property that is not included in the family patrimony is divided based on the rules governing the "matrimonial regime" adopted at the time of the marriage. In Quebec you can choose between partnership of acquests or separation as to property. If you have not entered into a marriage contract, the law decides your regime for you. The legal or default regime in Quebec is partnership of acquests. Separation as to property is adopted by marriage contract entered into before a notary. During the marriage you can modify your matrimonial regime by changing it from one regime to the other. Those who married after July 1, 1970 without a marriage contract are by law subject to the legal regime in Quebec which is partnership of acquests. If you have not signed a marriage contract then you will most likely fall under the legal regime of partnership of acquests. The Court now requires a Statement of Partnership of Acquests to be completed. If you have signed a marriage contract you most probably have adopted the regime of separation as to property. Under this regime there is only private property. The only common property consists of assets that have been purchased jointly by both parties. Each party remains sole and exclusive owner of the assets that are registered in his or her name, administers these assets during the marriage, and retains them at divorce. Married couples that have not entered into a marriage contract and who were married before July 1, 1970, are subject to the regime of community of property, which was the legal regime then in existence. Community of property is considered archaic and less often seen. Under this regime most of the assets that the parties owned before the marriage and acquired during the marriage are considered to be joint or common property at divorce. During the marriage the husband alone administers the assets that make up the community. The wife only administers her "reserved property" which comprises those assets that are purchased with her salary and are the product of her work. At divorce each party conserves his or her private property and has the right to one-half of the common community property. While community of property still technically exists in the law, it is rarely chosen as it dates back to the time of church influence in the law and traditional marriage. The civil law has evolved as the institution of marriage has become more and more secular and less traditional relationships have achieved legal recognition. If you married outside of Quebec, the regime applicable will be that of the place where you were "domiciled" (intended to reside) at the time of the marriage. Many countries have regimes similar to Quebec's legal regime of partnership of acquests. Whatever matrimonial regime is adopted neither party is directly liable for the other's debts. In the case of partnership of acquests, however, the other party’s acquests (or his property in which you would have the right to share) will be exposed to his creditors, and can be seized to satisfy his debts. In this way you may become indirectly liable as your share in the division of your spouse’s acquests can become less if his creditors intervene and seize his property before any division of the acquests is made. In Quebec since July 1, 1989 certain traditional "family assets" have been subject to what is known as the family patrimony. The net values of these assets are divided evenly, unless the Court decides otherwise. The key component in determining whether an asset that would appear to qualify as a family patrimony asset is actually to be included in the family patrimony is use by the family. As an example a painting which belongs to one of the parties that hangs on a wall in the family residence will be included, while a painting which is kept in storage and out of view would be excluded. The net value or increase in value, determined at the time of divorce, of the assets that qualify is divided. The family patrimony rules apply to the division of the assets that are included in the family patrimony even if there is a marriage contract in which you have opted for the matrimonial regime of separation as to property. It is important to understand that when the division of property is made at the final divorce hearing the Court will first apply the family patrimony provisions. The remaining assets will then be divided based on the applicable matrimonial regime. The division of the family patrimony assets must take place unless you have legally opted out of the application of the family patrimony provisions. To have done so you must have signed a deed to that effect before a notary prior to the expiry of the delay for doing so on May 1, 1990. The valuation of the assets subject to division in the case of both the family patrimony and partnership of acquests is made, as a general rule, as of the date on which the proceedings are instituted. By exception and on request, the valuation may be made as of the date of separation, providing that the parties have lived financially independent of one another since that time. When determining the value of family patrimony assets for partition it is important to remember that it is the net value of these assets which is divided - that is the fair market value at the date of evaluation less any debts contracted specifically in relation to any such asset for its purchase, improvement or maintenance. To arrive at the net value for partition of a house the cost of the sale of the property (i.e. the real estate commission) should be deducted, even if the parties do not have the intention to sell. Contrary to popular belief, the application of the family patrimony provisions does not make you a co-owner of family patrimony assets belonging to your spouse. Each party only has the right on divorce (referred to as a personal right against his or her spouse) to request that the net values of the family patrimony assets be divided. The right to request division arises only on divorce, or the death of one of the spouses. It is important to remember and understand that in partitioning the family patrimony assets, it is not the assets themselves that are divided, but only their “net partitionable values”. Each spouse remains owner of the family patrimony assets registered in his or her name. The total "net partitionable value" is calculated and then divided equally between the parties. The Court determines how the division is made. It may be by a division of assets so that each spouse ends up with specific assets having a value equal to one-half of the net partitionable value, or a spouse may be permitted to retain assets of a value greater that one-half of the net partitionable value, and provide compensation by paying the other one-half of difference between the value of the assets so retained and one-half of the total net partitionable value. Division of the family patrimony normally results in one spouse being entitled to a payment from the other to equalize the net partitionable amounts credited to each party. Payment is usually made in the form of a lump sum, or the transfer of an asset. The values of the assets, at the date of partition, that are determined to be part of the family patrimony are added to obtain a total gross value. Debts then specifically attaching to those assets are then deducted to arrive at the net value for partition. However, only debts that have been incurred for the acquisition, improvement, or maintenance of a family patrimony asset may be deducted to arrive at the net value. The best example to illustrate this would be a situation that arises often - during the marriage one of the parties obtains a line of credit secured by mortgage registered against the family residence. The advances taken on that credit line are used to finance a business enterprise or for some other reason not having to do with the acquisition, improvement, or maintenance of the home. At the time of partition such a debt, though constituting a mortgage on the family residence, will not be deducted to arrive at the net partitionable value for division, and will be a debt of the spouse alone who benefitted from the line of credit. Certain "deductions" may be taken by the owner of a family patrimony asset. A "deduction" means that the net partitionable value for division between the spouses will be reduced by an amount that is deducted and credited to the spouse entitled to the deduction before the division of value is made. Family patrimony assets that were acquired before the marriage are subject to division. The owner is entitled to a deduction for the net value of a family patrimony asset that was owned at the time of the marriage (and thus brought into the marriage), and as well to a further deduction for the "plus-value", or the increase in that value since the marriage proportionate to the ratio existing at the time of the marriage between the net value and the gross value of the property. The following example illustrates how the net partitionable value of a family residence would be calculated. Money that a party has prior to the marriage and used to acquire a family patrimony asset will not give rise to a deduction, unless that money was obtained as a result of the sale of an asset that would have fallen into the family patrimony, and the sale proceeds were directly invested after the marriage in the purchase of a family patrimony asset. The best example would be where a spouse owned a home prior to the marriage, sold it prior to the marriage, deposited the proceeds with a bank, and then took the money after the marriage and used it to acquire the family residence. A deduction may also be claimed from the net value for partition of the amounts of any gifts or inheritances used to acquire or improve an included family patrimony asset. There is also a right to a further deduction for the "plus-value" calculated on the value of the gift or inheritance. In this case the plus-value is the amount by which the gift has increased in value during the marriage proportionately to the value of the asset that it was used to acquire and/or improve. If a family patrimony asset, such as a house, was owned prior to the marriage and then during the marriage the spouse who is the owner makes the other spouse a co-owner (transfers a one-half interest to the other party) so that at the time of divorce the parties own the asset jointly, the right to claim the deductions referred to above may be lost. Making the other spouse co-owner will result in the renunciation to the right to take the deductions. The Statement of Family Patrimony which must be completed by the parties illustrates how the calculation of the net value for partition is made. The Court can order an unequal division if an equal partition results in an injustice to one of the parties. An unequal partition may be requested in the case of “injustice”, but remains the exception. An unequal partition cannot be requested simply because you feel that an equal division would be unjust. The injustice resulting from equal partition cannot result simply from the application of the law. It must result from something else that suggests that it would be unfair to equally divide the family patrimony assets that have been acquired. There must be “economic fault”, or conduct by one of the spouses that amounts to bad faith and which prejudices the other. The Civil Code speaks of "the brevity of the marriage, the waste of certain property by one of the spouses, or the bad faith of one of them". Injustice justifying an unequal partition occurs for example if one party has sold off family patrimony assets to avoid partition, if one party has purposely avoided accumulating family patrimony assets while being entitled to share in the family patrimony assets of the other etc. What happens if you happen to divide the family patrimony assets prior to the divorce judgement, and then one of the parties changes his/her mind? It may happen that, after separation and prior to the institution of divorce proceedings, or during the proceedings but prior to the divorce judgement, divorcing parties amicably divide the family patrimony assets between themselves on less than an equal basis, believing that the division so made is binding upon them. Subsequently, one of the parties decides that the division agreed to is unfair. In that case the entire division may be set aside. You should not proceed to a division of family patrimony assets on an unequal basis, and expect such an agreement to be enforceable, unless you are able to confirm the agreement in a signed written document and are reasonably assured that the Court will approve it. b) after the judgement of divorce it is made in a notarial deed which is then registered at the registry office within one year of the date of a judgement of divorce. During the marriage spouses are under an obligation to make proportionate contributions in money and services to what are known as the "charges of the marriage" - i.e. raising the children, taking care of the household, providing financially for the needs of the family etc. It often happens that at the time of divorce one of the parties realizes that he or she has done more than was required, or that he or she over-contributed in money and/or services, with the result that the other party has benefited or has been enriched. The division of the assets of the family patrimony may not redress this unfairness. A compensatory allowances are most often awarded when the parties are separate as to property. They are awarded only exceptionally under the regime of partnership of acquests. Examples of excessive contributions include working as an employee of a successful business enterprise owned by the other party, contributing to the acquisition of an asset registered in the name of the other party, giving up a career to care for children and thereby relieving the other party to successfully pursue a career and build equity, supporting the other party while he or she is pursues an education leading to a career etc. 4. that the enrichment continues to exist at the time of divorce. If by that time, for example, the other party has lost everything or gone bankrupt, no award will be made as there would be no "subsisting" enrichment. Mediation requires the Consent of both parties. Participating in the mediation process is not compulsory in Quebec. However, before proceeding before a judge in a contested case you must confirm to the Court that you have either tried mediation and it has failed, or that you have considered it as an option and in fact have opted not to mediate. A judge can adjourn a hearing and refer the parties to the mediation service at the Court or the mediator of their choice. The suspension of the hearing cannot be for more than 90 days. The parties must begin the mediation process no later than the 20th day after the suspension of the case. If the parties fail to do so, or the mediation ends or fails prior to the expiry of the period during which the case has been suspended, either party may apply to have the hearing resume immediately. Nothing that is said during mediation is admissible in court. A settlement conference with a judge (conference de reglement a l'amiable) is a procedure that is available after litigation has begun - not before proceedings have been taken. In such a conference the judge does not make any decision that is binding on the parties. He assumes the role of a mediator to assist the parties to resolve the issues that are in dispute. Unlike ordinary mediation, where the attorneys are absent, the parties attend with their attorneys who are there to advise them. The attorneys play a passive role. The discussions take place initially between the parties directly with the judge. The issues are identified. The parties and their attorneys then take separate rooms, and the judge goes back and forth until an agreement is reached or until it is determined that no agreement is possible. Like mediation nothing that is said during such a settlement conference is admissible in the litigation. In practice, settlement conferences have a high success rate because judge’s tend to be influential in helping the parties to evaluate their respective risks in going to trial and to make the necessary compromises to arrive at a settlement. A judge decides what the facts are based on the conclusions that he draws from the evidence made before him, including the documents submitted and the testimony given. In drawing conclusions based on the testimony that he has heard, the judge also has to assess the credibility of the witnesses who appear before him. A judge must then decide how to apply the law to his factual conclusions. In doing so he must interpret the law in a manner consistent with legal precedent (the jurisprudence). An appeal is the right remedy if there is good reason to believe that the trial judge has erred in his findings of fact or in his application of the law, with the result that his decision would have been different (and in your favour) had the error not been made. A judge makes an error of fact when he errs in the conclusions that he draws as to what the facts of the case are. Because the trial judge hears the witnesses, and is considered the sole arbiter (person who decides) of the facts, the Court of Appeal requires that an error of fact be "manifest" or evident in order for it to intervene. It has been said that a manifest error is one which “jumps off the page”. An error of law occurs when a judge wrongly interprets or applies a provision of law to his findings of fact. An appeal must be filed within thirty days of the date of the judgement in the Superior Court. In divorce cases (cases decided under the Divorce Act) there is an automatic right of appeal from final divorce judgements. Provisional and interim judgements require the permission of a judge of the Court of Appeal to proceed. In cases decided, not on the basis of the Divorce Act, but on a provision of the Civil Code of Quebec (for example - separation cases), permission to appeal from the Court of Appeal must also be obtained regarding interim and provisional orders. As in divorce, final judgements do not require such permission. In Quebec statistics show that approximately one-third (1/3) of all appeals taken are successful. Appeals of interim and provisional judgements, which are temporary in nature, rarely succeed. To have any chance it must be shown that an extreme injustice results from the decision. When the parties have signed an agreement that appears to settle all of the issues accessory to the divorce (i.e. custody, support, division of property etc.) it is still possible to put the agreement into question before it is approved by the court, and even to do so after the judgement of divorce has been rendered. Separation agreements are not set aside lightly. A separation agreement will not be set aside because in hindsight a party realizes that it is unfair or disadvantageous. When, at the time of the divorce hearing, a party asks that a separation agreement not be approved, there is a two-stage process that must take place to determine whether to set aside the agreement. In the first stage the Court examines the negotiating process and circumstances under which the agreement was concluded. In the second stage the Court examines the content of the agreement. In this stage the Court determines whether the negotiating process was contaminated in a material way. The purpose is to verify whether either party was vulnerable or susceptible to influence, whether the parties obtained competent legal counsel, and/or whether valid consent to the agreement has been given. To be valid consent must be informed. There must be a full and complete financial disclosure on both sides and nothing significant must be hidden. Neither party can misrepresent any facts that are material to reaching the agreement. Both parties must fully understand what is being agreed to and should be advised by competent and independent attorneys as to their legal rights. The negotiating atmosphere must be serene and neither party should feel constrained to sign by pressure or threats. If the agreement passes the first test the parties go on to step 2. This step involves an examination of the substance of the agreement. On the issue of support the Court must determine whether the agreement respects the factors and objectives set out in the law, both as to the amount and duration, and more particularly whether it represents an equitable sharing of the economic consequences of the marriage and/or its breakdown on the parties or whether it derogates in a significant way from the objectives set out in the Divorce Act for a judge to follow when making a support order. Once a judgement has been rendered confirming and ratifying a separation agreement, the provisions dealing with the division of the assets cannot be set aside unless you act within 15 days following discovery of the error which induced you to sign or the new evidence proving fraud or misrepresentation by the other side. This delay may be extended to 6 months on the condition that it was impossible for the petitioner to act sooner. It often happens that the family residence is registered in the name of one of the parties only, and not both. To prevent the house from being sold or mortgaged by your spouse without your consent you can register a “Declaration of Family Residence” at the land registry office. Once you have registered a declaration of family residence your spouse cannot sell, mortgage, or convey any rights in the property without your consent. “Moveable property” owned by one party, and in the possession of the other party, may be seized in the initial stages of the case before any judgement is rendered. Assets that form part of the family patrimony or partnership of acquests may be similarly seized to place them under “judicial custody” and prevent their disappearance, thus guaranteeing that they will be available when the time comes for division. A seizure before judgement can also be done to secure a claim for a compensatory allowance. If you can show that there are objective reasons to fear for the recovery of what you are asking because the other party is liquidating or hiding assets to avoid having to pay you what a divorce or separation judgement may order, you may also seize before judgement. Seizing before judgement usually means that, pending the divorce hearing, the seized assets are inventoried by a bailiff and left where they are, or entrusted to remain with the other party as guardian. The act of seizure has the effect of placing the assets under judicial custody, which means that they cannot be moved, tampered with, or sold. The removal of a seized asset is considered theft. In Quebec a tape recording of a conversation made without the knowledge of the party being taped is admissible where the welfare and best interest of children are concerned. Such a tape recording can thus be admitted into evidence if it relates to a subject pertinent to a custody dispute. To be admitted into evidence the entire tape recording must be submitted and the authenticity of the tape recording must be proven – i.e. it must be shown that the other parent is actually the person who has been taped. Grandparents in Quebec cannot be called upon to provide financial support for their grandchildren. The obligation to provide financial support between ascendant and descendent relations is limited to the first degree - i.e. between parents and their children only. A child has the right to maintain contact and continue a relationship with his or her grandparents. The child's parents may not interfere with the personal relations between the child and his grandparents unless there is a serious reason. If the parents and grandparents cannot agree on the extent of such relations, the court may be called upon to decide what they will be. As always the best interest of the child is the key criterion. 1. The hearing starts with a presumption that the maintenance of relations is in the best interest of the child. This presumption is, however, subject to rebuttal proof. 2. The parents are obliged to show a serious reason that justifies denying or curtailing the child's access to his grandparents. 3. The court then decides what access rights are appropriate, if any. Grandparental access may take the form of visits, telephone contact, letter writing, or family get-togethers. What form is adopted will depend on the circumstances of the case. While mentally ill the father shot and killed the wife's father and seriously wounded her mother. The father was found to be insane at the time of the incident. He was acquitted of the criminal charges brought against him and was committed for treatment to a psychiatric institution. The father's parents sought access to the couple's 2 year-old child. The mother refused, not wanting to have any relations with the father's family. The judge held that, despite what the father had done and the mother's anger, the paternal grandparents had been close to the child before the incident and it was in the child's interest to maintain contact with his paternal grandparents and the paternal side of the family. The death of a spouse at puts an end to the marriage. In the case of ongoing divorce proceedings, if at any time prior to the rendering of a judgement of divorce one of the parties dies, the proceedings are considered terminated and at an end. Any provisional judgements then lapse. Spousal support, however, may only be claimed from the deceased spouse's estate for a maximum period of twelve months and is payable by lump sum. A lump sum ordered against an estate can be made payable either immediately or by installments. The Court has discretion to determine the amount of support to be paid to the surviving spouse, which can be less than the maximum amount payable. The approach taken by the Court should be liberal, flexible and show sensitivity to the present and future needs of the surviving spouse. The right to claim the partition of the family patrimony includes the right to claim an unequal partition. An unequal partition can be requested against the estate of the deceased spouse. It must be shown that an equal partition would result in an injustice. The injustice may not, however, result from the application of the law which requires that there be a division of the family patrimony assets. It must be shown that the deceased spouse acted in bad faith such that it would be unfair for there to be an equal partition of the family patrimony assets with the estate. The surviving spouse may also bring a claim for a compensatory allowance against the estate based on an excessive contribution in money or services during the marriage that resulted in the enrichment of the deceased spouse, and by extension at his death of his estate. The right to claim support and to the partition of the assets subject to the family patrimony are considered “charges” upon the succession This means that they are claims against the estate that must be resolved and paid before the heirs can be paid. The heirs are thus paid from the assets left over after the surviving spouse takes his or her share of the family patrimony, is paid a compensatory allowance if applicable, and is paid what is determined to be due on account of spousal support. One spouse cannot sue another in damages as a result of marital misconduct. The redressing of conduct in breach of a marital obligation must be exercised by way of an action in divorce or separation based on the recourses available on marriage breakdown under the Divorce Act and Civil Code of Quebec. A claim in damages may only be made by one spouse against another, either joined to an action in divorce or separation or by way of a separate independent action, if it is based on fault that does not have its origin in the breach of a marital obligation. Examples of this are theft by one spouse from another, assault causing bodily harm and the like. The Divorce Act deals with the removal of barriers to religious re-marriage. Such a barrier may result from a religious law that forbids remarriage according to the religion of the parties unless both parties agree to a religious divorce. The law prevents a spouse from threatening to withhold a religious divorce in order to extract concessions, monetary or otherwise, in the civil divorce proceedings. If the spouse setting up the barrier, or opposing the religious divorce, is the Plaintiff, and the procedure set out in the Divorce Act (section 21.1) is followed, the Court has the power to dismiss the divorce application. If the spouse is the Defendant, the Court may dismiss any proceedings filed by that spouse. 21.1 (1) In this section, "spouse" has the meaning assigned by subsection 2(1) and includes a former spouse. (g) that the other spouse, despite the request described in paragraph (e), has failed to remove all of the barriers referred to in that paragraph. (d) strike out any other pleadings and affidavits filed by that spouse under this Act. (b) satisfies the court, in any additional manner that the court may require, that the spouse has genuine grounds of a religious or conscientious nature for refusing to remove the barriers referred to in paragraph (2)(e). (5) For the purposes of this section, an affidavit filed with the court by a spouse must, in order to be valid, indicate the date on which it was served on the other spouse. (6) This section does not apply where the power to remove the barrier to religious remarriage lies with a religious body or official. In the event of separation the proceedings taken will generally involve a motion for custody and child support. There is no such thing as "signing for divorce". If your spouse says that he or she will not agree to divorce you must bring a motion asking for a divorce asking that the Court make the orders necessary to resolve all of the accessory issues relating to custody, access, support, and division of property. If you and your spouse can come to an agreement on the issues that need resolution, you can sign a Consent and ask the Court to make the consent part of the divorce judgement. If there is no agreement your case will proceed as a contested one, in which case you will need to do everything required to complete the Court file to get a hearing date. A contested case is one where the parties cannot agree on all of the outstanding issues applicable to the case and require the Court’s intervention to decide their dispute. An uncontested case is one where the parties agree on the resolution of the outstanding issues applicable to the case, and are able to put their agreement in writing in the form of a “Consent to judgement” which they sign and submit to the Court for approval. If possible it is best to proceed by joint application. A joint motion does not have to be served on the other party and thus saves the cost of using a bailiff. A joint motion does not require a notice of presentation. An ordinary motion for divorce must be presented to the Court no earlier than 30 days subsequent to the date of its issuance. On the date of presentation the parties either proceed before the Court to obtain a judgement of divorce by making their evidence orally in front of the judge if the file is then ready, or they may ask that the file be referred for judgement and then, or shortly after if the file is not yet complete, deposit all of the necessary documentation. If, however, you proceed by joint application there is no need to present your request to the Court by way of notice of presentation at least 30 days subsequent to the date of issuance of the joint application. You simply issue the joint application without any notice, and attach all of necessary documentation comprised of the substantiating affidavits, the exhibits, Child Support Determination Form (if there is child support payable, article 827.5 declaration required by the Minister of Revenue for the collection of Child and/or Spousal Support), and a draft judgement, to complete the record so that the Court has everything that it needs to render a judgement of divorce. The Court then processes your file, and assuming that everything is done properly, both parties should receive the divorce judgement in the mail about three months later without the necessity of having to appear in Court. Where one party files divorce proceedings and the other does not contest, the case proceeds as an uncontested one. If there is no Contestation, after 20 clear days you must prepare an "Inscription for judgement by Default". the Child Support Determination Form if child support is to be paid - the information contained in this form must be validated by a Clerk of the Superior Court if you have not used the "Aliform " software. Assuming that you properly complete your file, it will take three to four months to get a divorce judgement because of the delays it normally takes at Court to process your file. For purposes of the family patrimony it is important to know the values of your RRSPs and pensions accumulated between the date of the marriage and the date of the institution of divorce proceedings, or the date of the separation. The anticipated cost of divorce will depend on whether the case is a contested one or not. In a contested case an hourly fee will be charged, usually based on the number of years of experience of the attorney taking the case. Hourly fees range from a low of $100 per hour to $300 per hour and up. It is difficult for a lawyer to reasonably estimate what a contested divorce will cost until the facts are made known and the issues can be defined. Even then all that an attorney can do is provide a “ballpark” figure. In family cases, it is advantageous to engage a lawyer with experience. The hourly rate should not, in principle, be the basis for your choice of an attorney. A lawyer with experience should be able to efficiently accomplish more in less time. The hourly rate of attorneys generally increases as the experience of an attorney increases, and reflects this basic, but misunderstood, fact. Federally, the payer cannot deduct legal fees incurred to establish or modify a child and/or spousal support obligation. In Quebec legal fees incurred for the purpose of modifying a child and/or spousal support obligation are not deductible. However, for the taxation years 2000 and following legal fees paid in respect of establishing the initial obligation to pay child and/or spousal support can be deducted. Legal fees to obtain a divorce or to obtain custody are not deductible. It is thus possible that only a portion of one's legal costs are deductible, depending upon the specific reason for which such fees have been incurred. You cannot remarry legally until you are officially divorced. Your divorce becomes final on the 31st day after the date on which the divorce judgement is rendered. If the divorce judgement, for example, is dated January 1, then you are only legally divorced 31 days later or as of February 1. You will not be free to remarry until then. A divorce granted in another jurisdiction can be recognized in Quebec on a motion brought before the Court here for an order recognizing the foreign divorce judgement and declaring it executory in Quebec. If the judgement was validly obtained abroad in accordance with the laws of the foreign jurisdiction, and your spouse was validly served and was aware of the process abroad by which the judgement was obtained, the petition will be granted and you will have an enforceable divorce judgement here in Quebec. Having an enforceable divorce judgement in Quebec may be necessary if one of the spouses has moved here with the children and a foreign custody or access order must be enforced, or if there are assets in Quebec that are subject to an order for support or division of property in the divorce judgement. Article 393 of the Civil Code states - "In marriage both spouses retain their respective names, and exercise their respective civil rights under those names". This means that after marriage a woman’s maiden name remains her name for legal purposes. Article 56 of the Civil Code says - "A person who uses a name other than his or her own name is liable for any resulting confusion or damage"
If you intend to use a hyphenated name, as long as you include your maiden name in the hyphenated name that you intend to use, you will most likely not cause the kind of confusion envisaged by article 56 as the name used will sufficiently identify you and should not cause third parties with whom you may enter into contracts to confuse you with someone else or to be unable to identify you. 8 LegisPratique : droit de la famille : jurisprudence en tableaux, 2009, Québec, LexisNexis Canda Inc., chapitre 3, p. 147-149; Mes Sylvie SCHIRM, Christine Cata, Marie-Christine KIROUACK, Suzanne PRINGLE, Justin ROBERGE, Andrée ROY et Linda SCHACHTER have commented on Gordon v Goertz as follows......les principes de cet arrêt s'appliquent même s'il ne s'agit pas d'une modification, mais bien d'une première demande assortie d'une demande de déménagement.